Showing pistols and swords from the Madrid Armory. Titled in the negative "Armeria de Madrid. 337. 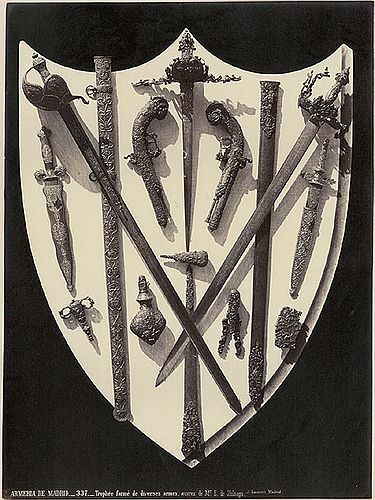 Trophée formé de diverses armes, oeuvres de Mr. E. de Zuloaga. J. Laurent Madrid." On sheet 21 x 17 inches (52x43 cm) with Laurent's Madrid and Paris studio copyright imprints.